Get ready- Cinema Sips is off on an international adventure! For the entire month of July, I’ll be showcasing some of my favorite examples of foreign cinema. I know I have readers from all over the world, so maybe these films aren’t “foreign” to everyone. But for those of us living in the US, be prepared- there will be gorgeous scenery, there will be unusual flavors, and there will be subtitles. Deal with it. To kick things off, we’ll be visiting India through the lens of Monsoon Wedding (DVD/Download). Perhaps my favorite example of modern Indian filmmaking, this movie expertly blends contemporary Western culture with traditional Bollywood stereotypes. Add a cocktail, and you’ll feel like an honored guest at the reception. Monsoon Wedding tells the story of an arranged marriage among upper middle class families in India. In a four day-long wedding extravaganza, we see the couple meet for the first time, learn their fears and dreams, and watch as distant relatives all come together to celebrate the union. I will admit, I grew up thinking of India through the typical Western lens- dirty, crowded, full of starving children, and telemarketers. However after seeing this movie, I discovered an entirely different side to the country. India is home to a beautiful world full of riotous color, arbors draped in marigolds, steamy summer nights, music, dancing, and laughter. Of course, what would a wedding be without a little family drama too? Director Mira Nair weaves a bold, complicated tapestry of family emotions, making the viewer realize that no matter what country you live in, embarrassing relatives are universal. Summertime in India calls for a fruity, refreshing drink. Mango seems to be a popular flavor in this country, and the celebratory theme of the movie calls for something light and uplifting. While watching Monsoon Wedding, I recommend drinking a Mumbai Mojito. Muddle mango, mint, and 1 oz of lime juice. Add rum, mix, then pour into ice filled glass. 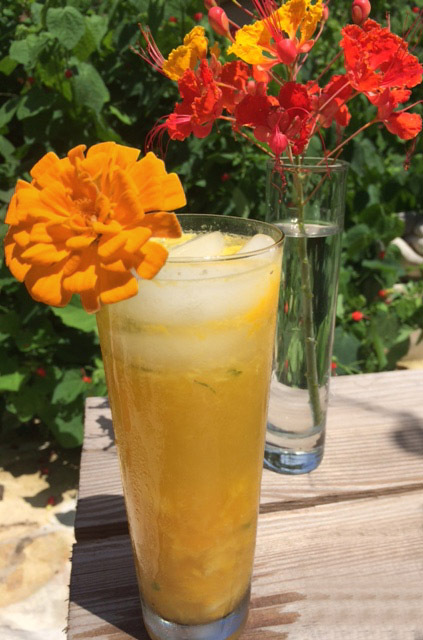 Top with club soda, squeeze of lime, and a marigold. By far my favorite character in Monsoon Wedding is wedding planner P.K. Dubey, who’s like a cross between Hrundi V. Bakshi and Martin Short in Father of the Bride. Permanently attached to his Nokia cell phone, he is the heart (and comic relief) of this film. His character is a lot like India itself- a blend of traditional cultural values, and new Western ideas. He can order up a weather-proof tent via this crazy new thing called email, but he can also tell you it won’t rain because the peacocks aren’t dancing. Now isn’t that the kind of planner every bride needs on her side? Cheers! Posted in Comedies, Foreign and tagged Bollywood, Cocktail and film, Foreign Cinema, India, India cocktail, Mango cocktail, Marigolds, Mira Nair, Monsoon Wedding, Mumbai Mojito. Bookmark the permalink.